Microbiologists Dr. Terry Leighton and his wife Dr. Frances Leighton founded Kalin Cellars in Marin County in 1977. Terry was the original winemaker at Domaine Laurier in the 1970s before launching his own label. Over the ensuing years, the Leightons have labored in relative obscurity shunning publicity while producing some of the most interesting California wines that only wine critics and wine geeks loudly testify to. The winery is located in an undistinguished warehouse in Novato, California, where the eccentric couple craft wines of unique character, age ability and individuality. Terry was the pioneer of unfiltered, sur lie-aged white wines in California dating back to 1981. The Leightons have used their background as research scientists to conduct studies on yeasts and chose yeasts that are very slow fermenters, believing slow fermentation is key for the evolution of flavors in wine, particularly the fifth taste, umami. Described as savory, pungent and meaty, umami is secondary to glutamates common in aged cheeses, meats and wines. The Leightons believe that most wines are not capable of acquiring umami because they are made quickly, sold shortly after each vintage, and consumed long before the fifth flavor is attained. The Leighton’s therefore release no wine before its time. Their style of winemaking produces wines that are not even close to being ready for at least five years. Unheard of in the modern business model of wine sales, they follow no set vintage sequence. The wines are released to the market when the Leightons feel they taste good, usually between 5 to 10 years after the vintage! The current releases of Pinot Noir are the 1998 Cuvée DD Sonoma County and the 1994 Cuvée Billon (Cuvée Rare) Sonoma. A 1997 Potter Valley Sauvignon Blanc Reserve and a 1994 Cuvée LD Sonoma County Chardonnay , a 1994 Cuvée DD Sonoma Chardonnay, and a 1994 Cuvée W Livermore Valley Chardonnay are also current offerings. Essentially every wine Kalin Cellars releases is a library wine! Check previous issues of the PinotFile for reviews of the 1990, 1994 and 1995 vintages of Pinot Noir. My favorite of all the Kalin wines may be the Semillon which is worth a search. 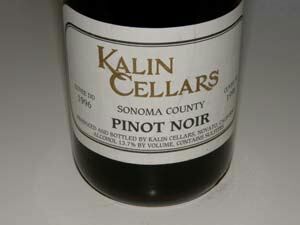 The Kalin Cellars Pinot Noirs are for connoisseurs and lovers of aged wine. They offer secondary bouquets and flavors that drinkers accustomed to young wines may find unpalatable. Look for notes of earth, forest floor, meat, soy and leather set off by racy acidity. Most Kalin wines are uniquely designated by letters which are shorthand for identifying specific vineyard locations and signifying cuvées. Prices are quite reasonable ($30-$45) considering the wines have been cellared for years before release. The quirky website lists currently available wines for sale. Production is roughly 7,000 cases annually. To order wines, fill out the online order request form. A few select retail outlets (www.klwines.com, Bristol Farms markets in California) and wine savvy restaurants offer the wines as well. Terry will be making a rare appearance at the Redwood City K&L Wines store on Friday, March 19th from 5:00 to 6:30 P.M. for those who live in the Bay Area. The winery is not open for tasting or tours. You can contact Terry (“Dr. Fermento”) by e-mail at tjl@ix.netcom.com. 415-883-3543. 13.8% alc., $45. · Deep reddish-brown, even mahogany color in the glass. Subdued aromas of macerated strawberries, brown spices, leather, roses and green garden. Performs better as it opens in the glass. On the palate, the berry fruits are complimented by flavors of brown sugar, bacon, smoke and grapefruit. A lively grip of acidity highlights the finish. Good. 13.7% alc., $45. · Moderately deep reddish-purple color with a golden rim in the glass. Much better color than the 1998 vintage. Aromas of beef stew, marzipan, and bacon fat with a hint of smoke, ash, nuts and latrine. Many subtle and highly nuanced flavors including blackberries, plums, beef, braised meats and a lingering hi-strung citrus note on the snappy finish. Still possesses some rich fruit on the mid palate and the mouth feel has become plush and inviting. Has held up extremely well with considerable interest and intrigue and will perform nicely at the table. Very good.